Bastian Schweinsteiger is in line for a shock recall to Manchester United’s Europa League squad. The German midfielder has only made two first-team appearances this term, in the EFL Cup victory over West Ham in November and the FA Cup win against Reading earlier this month. However, Schweinsteiger could be called up for United’s fourth-round FA Cup tie against Wigan Athletic also on Sunday. Furthermore, Jose Mourinho has revealed the 32-year-old will be restored to United’s team for their Europa League campaign, having been ignored for the group stages of the competition. Mourinho said: “I have to read the situation and decide, we don’t have many midfield players – I played three [at Hull on Thursday]. 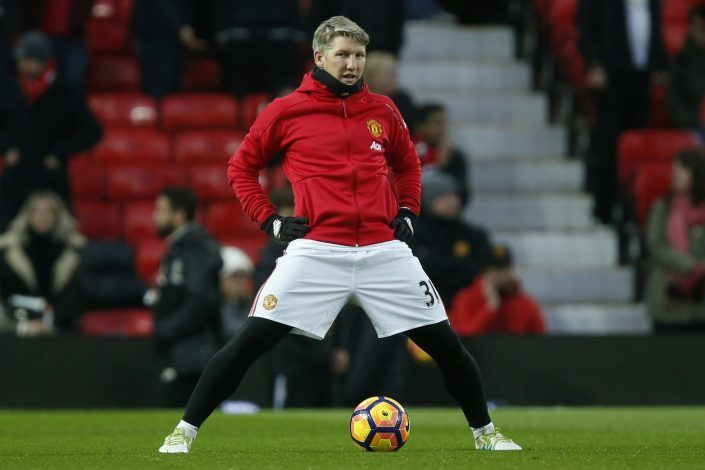 Marouane Fellaini was on the bench and Basti stayed in Manchester so, normally, he comes into the squad. Basti will most likely stay at Old Trafford for the remainder of the season, after insisting he would not join any other European club. With Manchester United playing so many fixtures in such a short time, Mourinho has decided to rotate his squad to keep them fresh. United will resume their Europa League campaign next month, when they face Ligue 1 side St Etienne at Old Trafford on February 16, before making a trip to France for the second leg a week later. Schweinsteiger returned to the United squad for the first time for West Ham’s Premier League visit in late November, and also travelled for the three fixtures against Crystal Palace, West Ham and Stoke, but didn’t get any chance to play in the league this term. The veteran midfielder’s contract expires in 18 months.